After a busy couple of months renovating, we've now moved house.. and workshop.. Not a small job! A very happy new year to one and all.. May 2014 bring you all that you hope for. In our case, it'll be a move from Christchurch to Richmond, Tasman at the top of the South Island of NZ. We're currently hard at work packing up the workshop and house, ready for the removal trucks on the 14th January. It's been a desperately hard last 3 years in Christchurch and we are SO looking forward to living in a place that isn't 'broken'... Onwards and upwards! As far as further earthquake news goes.. yes, we're still getting aftershocks (up to about 8000 now), but they are slowing down in strength and frequency, at last. Due to severe land damage, part of our suburb (unfortunately the part where we live) may have to be abandoned. We are still waiting to hear whether we will be househunting, or not.. But on a brighter note, compliments of the Season to you all! Still doing Ok, the big generator in the street is still doing its job, the toilet still flushes, though goodness knows where it's going, since our sewage system is, in local vernacular, "munted", we now have hot water too thanks to an innovative electrician and we're expecting our chemical toilet to be delivered any day now - oh joy. On a brighter note, I've found the floor of the workshop, it's now a lot tidier than it ever was and the big cracks will soon fill up with wood dust when I finally get back to work. Well we're doing ok.. Amazingly the water came on today and a stonking great generator appeared down the road yesterday, so we've now got electric light AND water. Woohoo! Still have to boil it though. No internet, but the phones are working, this is being written at a friend's place across town. Odd moments - a police car delivering food yesterday, a fire engine delivering a parcel of home baking.. And a police car with 5 cops from New South Wales (bless them) stopped for a chat. Christchurch is obviously the place to be. We're all so hugely grateful for the incredible help and support from all over. And so sad for those who have lost loved ones. Just want to let people know that Davy and Libby are both ok after the earthquake in Christchurch. But the house and workshop have been damaged and they have no power, no internet etc. Davy will get the workshop back in action as soon as possible but it may be a while before things get back to normal. Well, we're still here, picking up the pieces. We're also still being hit by multiple aftershocks, so the nerves are a bit frayed, to say the least. 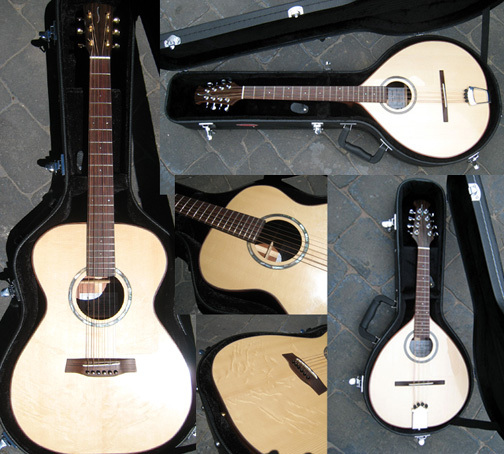 => A new prototype guitar/bouzouki.. 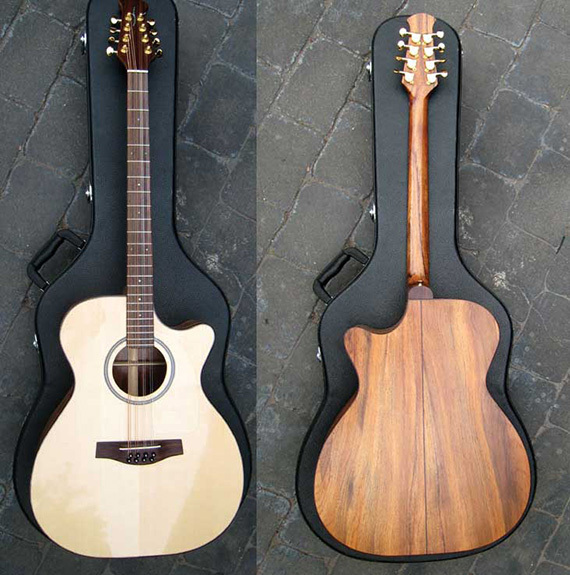 The new prototype guitar/bouzouki, a modified cutaway guitar shape allowing 16 frets to the join with body. 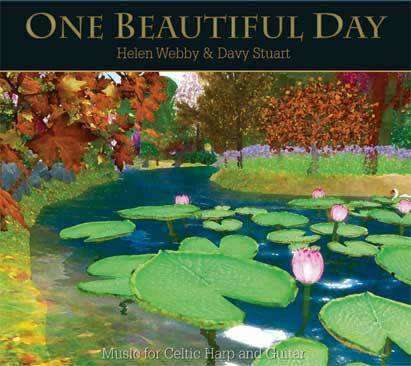 Excellent full sound, big bass response and nice clear trebles. And a great test of new supplies I have of NZ grown Tasmanian Blackwood. I think this will be joining the bouzouki options available. 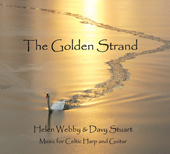 => New Harp/Guitar CD available now..
--> Home are the travellers..
And it's good to be home, after 5 weeks in Europe. Lots of snow, lots of travel, lots of great times. And the surprise bonus of seeing the great Donegal band 'Altan' in Paris. --> On the road, again..
Goodbye Summer and hello Winter, as my wife and I are off the UK and Europe for Christmas holidays. Yes, I know, luthiers are always on holiday anyway. All best wishes of the Season and please bear with me if i take longer than usual to respond to emails. --> Website revised - at last! Welcome to the revised website, at long last. It'll no doubt undergo more changes in the coming weeks, but I hope you find it easy enough to navigate around. Now I must go and do some 'proper' work at the workbench, making pieces of wood smaller. Thanks for visiting! When Chris asked me to build him a guitar, I was shocked, surprised and pleased, though not necessarily in that order! While on tour here in New Zealand, he got the chance to play a few of my guitars and settled on my cutaway OM-style model. We talked about timbers and the like and how it would be nice to produce something which might visually complement Maire's harp on stage. Net result? Black. 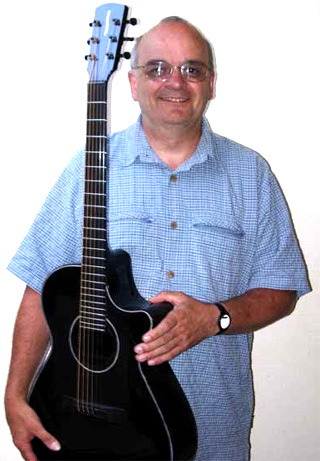 And he meant BLACK - machineheads, nut, saddle - if it could be black it was to be.. And I said yes... though it was me who suggested putting Mother of Pearl around the soundhole and the edge of the front. The only other requirement - a full 24 fret ebony fingerboard with Mother of Pearl side position dots. Of course when the time came to build it, the full implications became apparent. The select flamed Honduras mahogany neck, the AAA grade Indian Rosewood back and sides, the AAA grade Italian Spruce front would all have to be painted... Of course the further on the process went, the more difficult it became to cover up all that lovely wood. I tried hard to persuade him otherwise but Chris was determined. And so black it was to be, which of course got me thinking. The inside had to be painted too. And how can you get nuts and saddles in black? A bit of trawling and presto, Graphtech nuts and saddles. And sourcing Mother of Pearl wasn't a problem, though cutting all the pieces one by one was time-consuming - no laminated shell here, this is solid 1mm thick pearl! And so it took shape.. until finally I sent it off to John Sutherland in Wellington, NZ, a trusty friend who had agreed to custom paint the instrument in metallic black, "with a hint of red". And Black Beauty was born.. Now with the addition of a K&K Pure pickup it has taken its place 'on stage'. Life is great down by the beach- our dog thinks he's died and gone to heaven.. Lots of vistors last month, including James Keelaghan, Oscar Lopez and the indefatigable Andy Irvine. Great crack altogether!